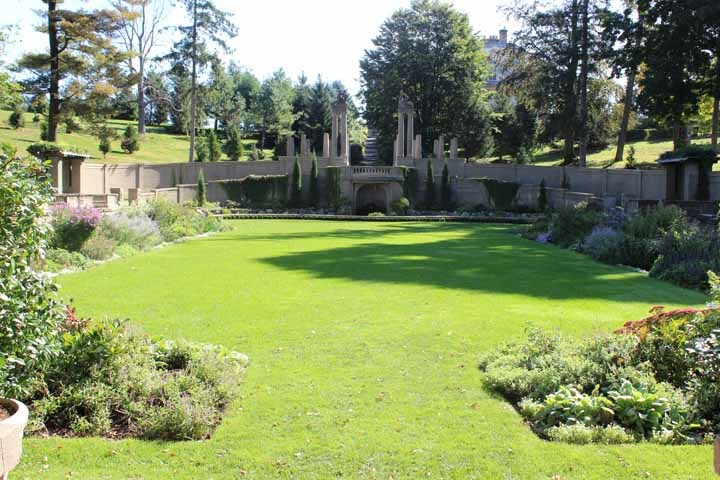 Since for several months I had heard about the beautiful restored Italian garden at the Crane Estate, I had to visit. 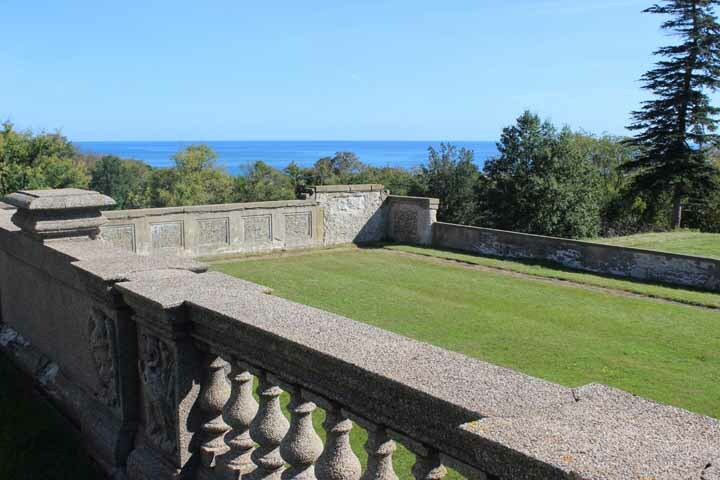 The non-profit Trustees of Reservations owns the property called Castle Hill and its Crane Estate, right along the ocean on Boston’s north shore in the town of Ipswich. Today Castle Hill remains a 165-acre National Historic Landmark. When Chicago industrialist Richard Crane bought the property as a summer home for his family in 1910, he built an Italian villa. In 1928 he replaced it with a 59-room English-style mansion. [below] A gravel drive welcomes a visitor to the house. The house, high on a hill, is situated quite close to the waters of the Atlantic. The Italian garden was the first and most elaborate of the gardens created by the Cranes. 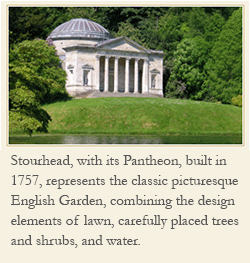 They chose the Olmsted firm in Brookline to design the garden. The garden, to which you descend as you walk from the house, includes remarkable stonework in archways, terraces, and statues. Its fountain stands at the center, along the front wall. 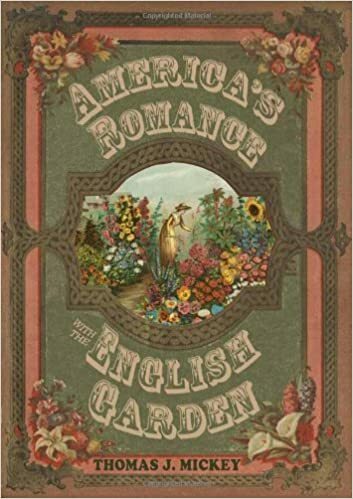 Many of the perennials that make up the garden beds would be familiar to any gardener. They include sedum, phlox, echinacea, and monarda. In the early 1900s perennial beds were the fashion. So was the Italian garden. 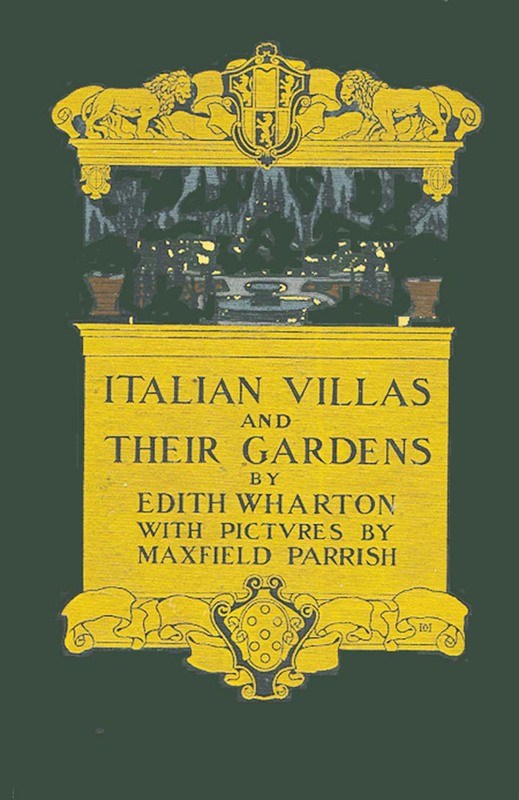 After all, that was the time that popular garden books included Charles Platt’s Italian Gardens (1894) and Edith Wharton’s Italian Villas and their Gardens. The four-mile, white-sand Crane Beach, which I have visited many times over the years, is located just beyond the entrance to the road that takes you to the house. The beach has become a wonderful summer attraction for many on the north shore. 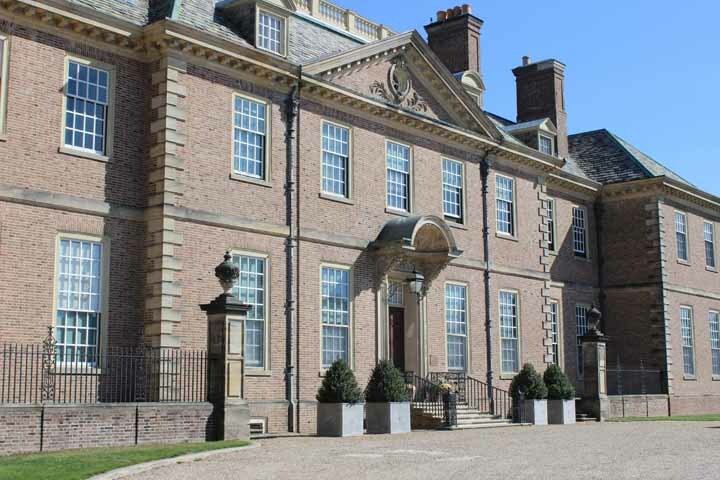 This garden at the Crane Estate, restored in the last year or so, certainly reflects the period of the house along with its owners’ love of the Italian garden.